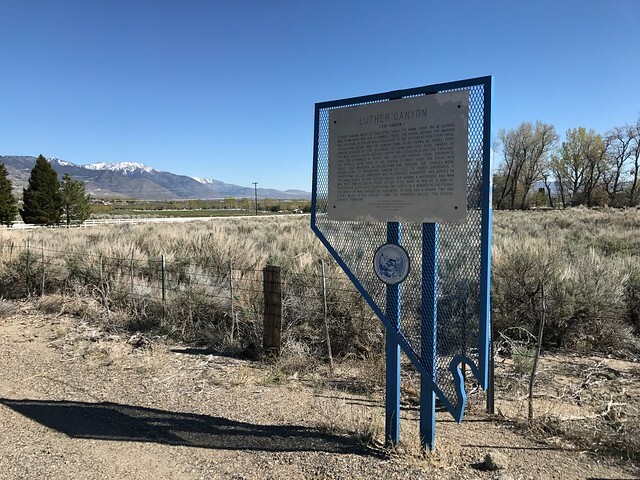 Wandering home from the Petersen Shootout, I made a circuit around the Carson Valley stopping at a number of Nevada Historical Markers, including: Luther Canyon (Fay Canyon) [#118]; Walley's Hot Springs [#120]; Pottsville [#121]; Sheridan [#122]; Boyd Toll Road [#124]; Gardnerville [#129]; Minden [#130], and; Dresslerville [#131]. This marker is located at 445 NV-206, Gardnerville, Douglas County, Nevada. There are 17 other historical markers in Douglas County. 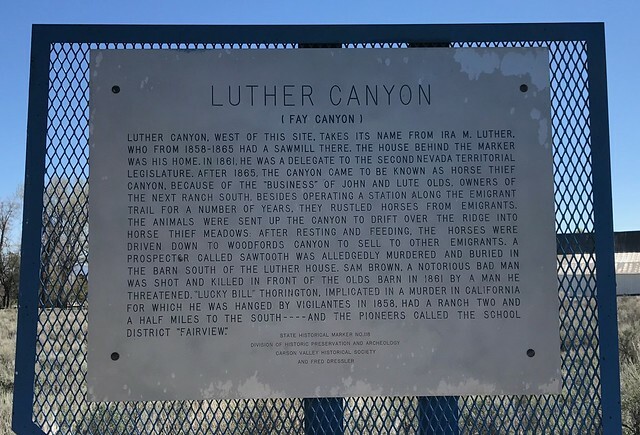 The GPS coordinates for this location are 38° 52' 13.7" N 119° 48' 33.8" W.
Luther Canyon, west of this site, takes its name from Ira M. Luther, who from 1858-1865 had a sawmill there. The house across the road (east) was his home. After 1865, the canyon came to be known as Horse Thief Canyon, because of the "business" of John and Lute Olds, owners of the next ranch south. Besides operating a station along the Emigrant Trail for a number of years, they rustled horses from emigrants. The animals were sent up the canyon to drift over the ridge into Horse Thief Meadows; after resting and feeding, the horses were driven down to Woodfords Canyon to sell to other emigrants. A prospector called Saw Tooth was allegedly murdered and buried in the barn south of the Luther house. Sam Brown, a notorious badman, was shot and killed in front of the Olds barn in 1861 by a man he threatened. "Lucky Bill" Thorington, implicated in a murder in California, for which he was hanged by vigilantes in 1858, had a ranch two and a half miles to the south--and the pioneers called the school district "Fairview."